I steal with style— sung by Jamie Lockheart the handsome anti-hero whose stylish stealing includes stealing the clothes, virginity and, of course, the heart of the beautiful Rosamonde . 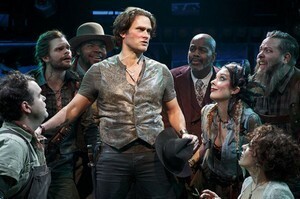 The corn (but not the kind on the cob) is as high as an elephant's eye (with apologies to Rogers and Hammerstein) in the Roundabout Theatre Company's robust, rib-jabbing revival of The Robber Bridegroom at the Laura Pels Theatre. This lively but otherwise rather loony musical was originally presented twice on Broadway. It had a limited run in 1975 and then returned for a somewhat longer run (145 performances) following a lengthy road tour in 1976 when it chalked up a number of Tony nominations with its lead Barry Bostwick picking up the major award for Best Actor in a Musical for 1977. The Robber Bridegroom is based on the 1942 novella by Eudora Welty who was apparently inspired by fairy tales (see Elyse's add-on notes below). This stage adaptation by Pulitzer Prize-winner Alfred Uhry (Driving Miss Daisy ) is currently presented with aggressively imposed cleverness. The top-drawer cast that can't be faulted for being super energized under the relentlessly frenzied direction of Alex Timbers. Set in Rodney, Mississippi, the story follows the exploits of a dashing but mercenary bandit Jamie Lockhart (Stephen Pasquale) whose mission it is to woo and wed Rosamund (Ahna O'Reilly) the lovely daughter of a wealthy plantation owner (Lance Roberts.) Jamie is thwarted in his efforts by Rosamund's wicked and jealous stepmother Salome (Leslie Kritzer) who enlists the aid of a pair of local scoundrels (Andrew Durand and Evan Harrington) to do her dirty work. There is, of course, the local doofus called Goat (Greg Hildreth) who, amidst the cavorting villagers, is present mostly to remind us of the obligatory fool who often punctuates a scene or two in Shakespeare's comedies. Pasquale, who impressed with his lauded performances in The Bridges of Madison County , fits the bill perfectly as Jamie the tall, posturing and posing charismatic seducer with a great voice. O'Reilly finds layers of humor in Rosamund, whose tendency for habitual lying is part of her charm. There is no competition, for the fearlessly over-the-top, purposely audience pandering Kritzer as the scenery-chewing Salome in whose gorgon-esque portrayal many will see shades of the early Carol Burnett. An impressive physical frame — the interior of a huge wooden barn —has been erected for the story-telling, the work of set designer Donyale Werle wherein all of the many props and set pieces are either hanging, leaning or clustered on the walls and rafters and ready to be put to use and to also suggest various locations by the gung-ho company. The set is often bathed in the flickering lighting created by designers Jake DeGroot and Jeff Croiter and it is wondrous. The overly cluttered unit set, which worked spectacularly for Timber's exciting staging of Bloody Bloody Andrew Jackson , is, however, becoming a bit of a tiresome trend,. Less tiresome and smoothly integrated is the thighs-slappin', feet-stompin' hoedown-ish choreography by Connor Gallagher. It has a canny way of complimenting the picking, plunking and twanging country music-styled score by Robert Waldman, who some will fondly remember for the forgotten one-performance only musical Here's Where I Belong and forty songs for Captain Kangaroo. The fine supporting cast, mainly seen as happy-go-lucky villagers, are generally on stage throughout; as is the splendid band, all ready to participate in what is essentially a romp in pure foolishness and mischievous mayhem. As staged, the ninety minute show offers its folksy wares gleefully and performed as if the company is aware that the audience is watching them. They appear to take great pleasure in breaking each other up, laughing at themselves for our amusement. Unfortunately that conceit looks just a little labored, a sign that rather defines the show in general. When Eudora Welty ((1909-2001)) published The Robber Barron in 1942, she was already recognized as one of America's most promising writers. But besides being Welty's first venture into novel-length fiction, it also established her as an adventurous writer, not afraid to break away from the critic proof path of her every day Southern settings and jump into the world of the Brothers Grimm. Her fairy tale was a deceptively simple story inspired and loosely based on such Grimm tales as Cinderella and Snow White but it was actually a subtle and densely plotted work that depicted both a bit of American "tall tale folklore about the wild and wooly life of the 18th Century American frontier with a parody of the Brothers Grimm's world. There are also evocations of Shakespeare and the Cupid and Psyche myth with an American twist. Four more novels followed The Robber Bridegroom before Alfred Uhry and composer Robert Waldman adapted it as a musical in 1975: Delta Wedding, The Ponder Heart, Losing Battles and The Optimist's Daughter which won the 1973 Pulitzer Prize. The musical was set in 1795 and that reversal of the show's birth date made an undoubtedly intended connection between that period's Watergate scandals to the still rough and tumble world along the Natchez Trace. The backwoods setting lent itself to presenting the show as a sort of non-stop, exuberant country dance with the key characters shouting out plot developments like so many square dance callers. As pointed out in Simon's review, The Robber Bridegroom wasn't a flop, but neither was it a long-running Broadway hit. Maybe the time wasn't ripe for a blue grass score unlike the current revival which has its official opening on the same day as a quite different contemporary musical, Southern Comfort . But while it took 40 years to mount another production in Manhattan, the story theater format opened it up for very flexible staging. This, along with the colorful characters has made it a favorite along the regional and college circuit. Now that it's back in a high profile Off-Broadway theater, director Alex Timber has taken every opportunity for ratcheting up the fun which includes performers sashaying up and down the aisles. Of course, no amount of catchy country songs can capture Welty's mastery of colloquial speech and rich place descriptions. That's why her novels and short stories are still in print. A handsome paperback edition of The Robber Bridegroom is for sale in the Laura Pels lobby. From 2/18/16; opening 3/13/16; closing 5/29/16.